Winter is here, although we have had little snow to this point. This has not slowed down the enthusiasm for winter images. 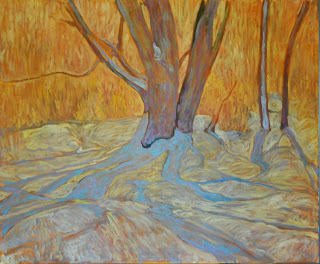 I have just finished a couple of 30 x 40 canvases where I have tried to depict the feeling of light on snow in 2 different ways. 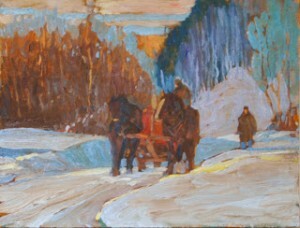 The first is at evening, just as the light is fading – an image of a woodcutters wagon coming along a road. 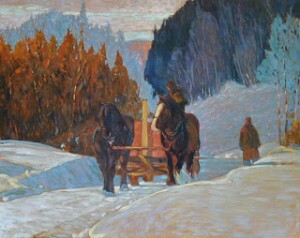 This image is tip of the hat to some great Quebec painters who capture this motif with amazing results. The other image is of an old maple at the edge of a field. Here the morning light filters through the trees from behind. 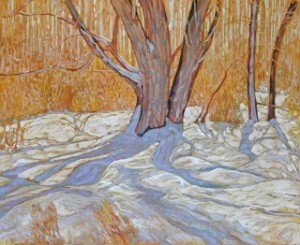 This provides a great opportunity to explore the dappled effect of the sunshine on the snow and the suggestion of the shadows of the branches. 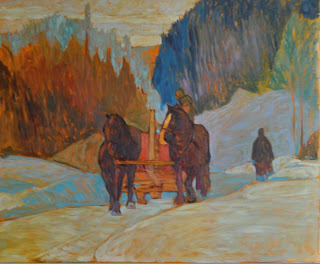 Many of you are curious to see a painting in progress so I have included some photos for the prelim sketches as well as the canvases at various stages. To all, enjoy a great holiday season and thank you again for your support. https://www.gartharmstrong.com/wp-content/uploads/2017/02/cropped-GarthLogo3.png 0 0 Garth Armstrong https://www.gartharmstrong.com/wp-content/uploads/2017/02/cropped-GarthLogo3.png Garth Armstrong2011-12-16 17:42:502013-04-17 10:54:30Always chasing the light.